​Mars moves into its feminine sign, Scorpio on February 20 2016 and will remain in the sign for a longer than usual period this year due to it being retrograde from April 17 to June 29 - returning to Libra for a brief period between June 17 to July 11. This means Mars will be mostly placed in Scorpio from February 20 until September 18 this year, placing a greater emphasis on the sign Scorpio for the coming months, and a need for more calculated actions with the aim of increasing our inner strength and resolve. Scorpio is a fixed sign and the natural 8th house of change. So, there is an inherent conflict with the sign. It's fixed, which means it is about keeping the status quo. However, at the same time, it's all about change. It's a water-dominant sign, which means it has more of the influence of the water element and the needs here are more emotional and under wraps for a large part of the time, as the 8th house represents hidden parts. 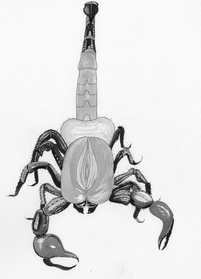 This is quite literally the case in the physical body, as Scorpio represents the sexual organs and our sexuality. An iceberg is a good representation of Scorpio, as is a hole in the ground, or a cave, for example. There is a lot going on under the surface; full of things we would prefer to keep there. Bringing these things out into the light is like walking around with your private parts on display! ​Those with the sign prominent in their horoscope have more drama in their lives because of this need to hide. This results with them feeling a lot of pressure underneath the surface of things. This can, at times, reach the surface at the most inappropriate times, and is one of the reasons why they are one of the least favored signs of the zodiac (the other being Aquarius). You might think that they are given a hard time, and you may be right, but don't be fooled, those with Scorpio prominent really enjoy the conflict! They are always looking for something to chew over and never quite settle unless they are working something out. Trust me, I'm speaking from experience! ​This is one reason 'we' make good investigators and astrologers, by the way. As someone with the sign rising in my horoscope, I always have to understand how things tick, by pulling it apart before putting it back together again. I have a need to get to the core of something - as fast as possible. This is why when a client consults me in astrology it often takes them a long time to assimilate all we have uncovered together. Mars rules the water-dominant Scorpio, but it represents the fire element. Fire and water do not combine well, as you know, and may be seen in substances which combine them both with explosive results, e.g. fuel. Mars ignites an already volatile situation created by the presence of Saturn in Scorpio since the end of 2014. Saturn represents air. What happens when we light a match to fuel and add oxygen? ... BOOM! How you engage with this explosive transit will depend. There is a need to fight the good fight and to put this release of energy to good use, as if an internal combustion is occurring which sets us off into new territory. This transit is a game changer. The more you engage with it consciously, the more you can make it work for you. The less you engage consciously with it, the less control you will have over your egotistical responses. And Mars is all about the childish part of us; the part that wants to have its own way, no matter what the cost. And with Scorpio's influence, the cost feels great. ​Mars represents our strength and courage, and, in particular, our emotional strength when relating to Scorpio. It represents our ability to destroy the things which are making us feel weak, which can be anything from a substance, to a person, to a certain situation. These things vary depending on what Mars represents for you personally, but no doubt Mars' strength in Scorpio will arguer well for the planet of action and aggression, but less so for the status quo, or for those with weaker constitutions. ​We all have a different way of expressing our aggression. The Earth has its own way of releasing pent up energy and we would do well to take a lesson from this process. Our aggression is largely dependent on how Mars is placed in our own horoscope. Those with a strong and prominent Mars couldn't hide their aggression if they tried. If they do they only end up beating themselves up (and everyone else in their immediate environment) in the meantime. So, if you are one of those people I would suggest you get out and exercise this spring and summer, keeping yourself cool while doing so if you live in a hot climate. This transit will heat up some intense situations for the next few months so it is better to work with it so that it doesn't work against you. I, myself, will not be travelling to Brazil for the Olympics in August, for example, when Saturn and Mars come to exact conjunction in Scorpio - the sign of death and disease - but I do plan a more rigorous exercise routine which is more carefully planned out, and view the sporting greats in Rio push themselves to their limits. So, if Mars is all about becoming strong, why does it work against us so much? Well, the simple answer is: we don't know when to quit. ​Mars is seen as a malefic planet for good reason. It is destructive. The word used to describe it in Vedic astrology is Tamas, a Sanskrit word which could be translated into English words such as 'dark', 'inert', or 'dull'. Although you may think of Mars as anything but 'dull', an important distinction to be made is that the process of destruction itself is what is referred to - even if we are destroying something which needs to be destroyed. It would be just fine if we were to perform an action which made us feel strong and let that be that. However, we cause just as many problems for ourselves by rubbing others up in the wrong way, or by overdoing it, in the process. Physically, Mars represents imbalances of Pitta dosha, i.e. inflammatory conditions, with the presence of irritability and anger. Infections are more likely during Mars' transit through Scorpio; diseases incubated in damp environments in the body and on the planet. Anger increases while Mars is strong, and this is worsened by the presence of Saturn, making it feel all the more frustrating. ​Don't forget, others are undergoing the same process as you and fighting is an inevitable expression at times. Mars is the 'planet of war', after all. Fighting is likely to increase between individuals and nations as a result of this transit. Just do it ... Mindfully! Saturn is present in Scorpio for Mars' transit, with both coming together in August. This holds the dynamism of Mars in check to an extent. ​'Just do it' is a phrase easily associated with Mars, but while it is placed alongside Saturn we must include the word 'cautiously'! Perhaps a better expression would be: 'Just do it...Mindfully'. The release of energy from Mars is uncontrolled at times, as is the case with someone losing their temper. Those with a more controlled Mars in their horoscope may be more capable of controlling it and expressing it more appropriately through means of a discipline. However, the results of repressed anger can wreak havoc on that same person, as anger is not an emotion which wishes to be controlled. It can get messy, just as the transit of Mars doesn't fit into the usual transit framework. Think of Mars as the brat in you who never got his or her way. Now, throw this brat in a room with a can of petrol and a box of matches, and call him or her a few choice names. Ok, I think you get the picture. World leaders are no different, unfortunately. And many would argue that they are playing out our own infantile dramas, while we sit back and watch; pointing the finger. We all have little brats inside us which are triggered from time-to-time. ​For your own life, I would suggest becoming more acquainted with your anger (and your pointing finger! ), finding healthier and more productive ways of expressing your rage.​ Many go to the gym for this very reason. Others, take up martial arts, and others end up having arguments. Personally, I prefer to use my anger to fuel my physical disciplines which ultimately benefit me. I have also found some dynamic forms of meditation to be very helpful and an effective way of controlling where and when I release anger, leaving me with a great sense of ease, as a result. Mars' influence on the sign Aquarius is another indication of the fight for human rights that will be a red hot topic throughout the year. ​Mars also influences the signs Taurus and Gemini while in Scorpio, leading to anger being expressed over poorly managed resources, as well as curt communicative styles, in general. Then there is the exchange between Saturn and Ketu, the south node and Scorpio's other ruler, which is currently placed in Aquarius. For Leo, be aware of losing your work/life balance completely and ending up taking it out on those nearest and dearest. For Cancer, take a chance on new opportunities, by coming to terms with your own repressed ambitions. Otherwise, this transit can be a frustrating affair. For Mercury's signs, Gemini and Virgo, there is a need to work more skillfully with this transit, as Mars is a tricky one for you to deal with, and Saturn's inclusion creates a precarious situation. Deal with your demons on your own before confronting any issues with others. For Venus' signs, Taurus and Libra, there is a need to address relationships issues head on and not shy away from the disscussion, as long as you've vented your anger in appropriate ways prior to the debate. If not, then you will only end up arguing and causing more problems for everyone concerned. For Mars' signs, Aries and Scorpio, whatever you do, do not simply sit on this energy for the next few months. It requires your active involvement. This should include at least some physical exercise. For Jupiter's signs, Sagittarius and Pisces, you may be able to hide from certain issues in a daily reflective practice of some kind, but be aware of 'spiritual bypassing'; skirting around the real issues. This transit requires at least some remedial measures, so the heat of Mars does not get out of hand. This is especially the case during the summer months as heat increases in the environment and in our physiological make-up. Mars is remedied by the Moon, so try introducing meditation into your daily routine as this may help cool you down - ideally a physical one such as hathayoga or some form of martial arts. Being by the sea, or a body of water, has cooling effects also, but sometimes something simple such as counting to ten, before saying or doing something you may regret, may help. Make sure to stay well hydrated by drinking adequate amounts of water - increasing your intake if you exercise your demons. Breathing exercises such as Nadi Shodana, the alternate nostril breathing technique, helps to balance the mind and body, and would be of great benefit if there is a dominance of right nostril breathing, which correlates with a left-brain dominance, representing logic. ​Even though you may see things logically if you are left-brain dominant, logic itself can be seen as a type of violence; using words as weapons, as you force your opinions on others who may not see your logic. As you breathe through the left nostril it is cooling to your body and mind, as Ida is the lunar nadi, or 'lunar channel' which corresponds to the left hand side of the body and the right-hand side of the brain. This plays more of a role in the subtle aspects of interaction such as interpreting context and tone in a person's voice. This will be needed during Mars' trek through the underworlds of Scorpio. In the end, wisdom comes from our actions, as regeneration occurs after destruction; represented of the sign Scorpio. ​By maintaining balance and equilibrium in the midst of the forces of decay and rebirth, we learn to improve our lives by the mistakes we make and the lessons we learn along the way.